The Symposium features lectures on the investigations, science, and history around UFOs and paranormal history. 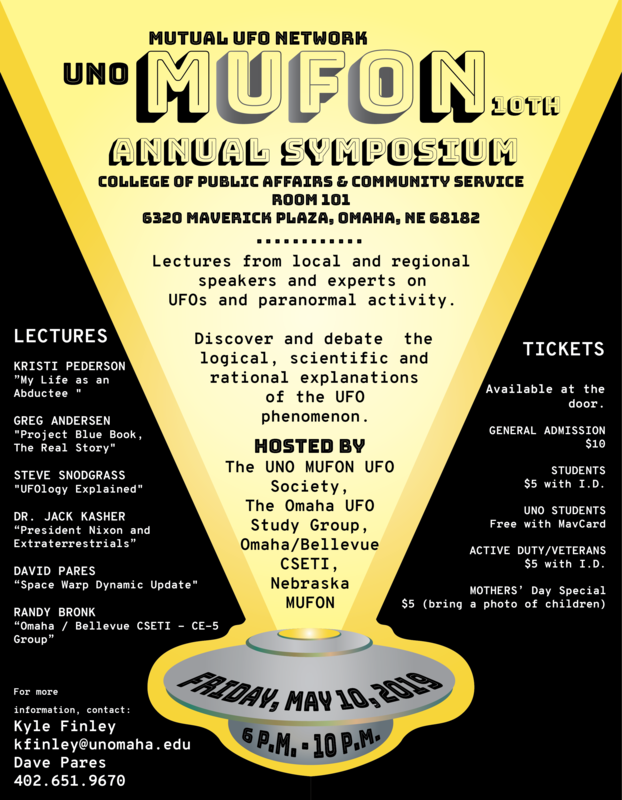 The UNO MUFON UFO Society and local groups the Omaha UFO Study Group, Omaha/Bellevue CSETI and Nebraska MUFON collaborate to organize the symposium and bring the lecturers to Omaha. The event will run from 6 p.m. to 10 p.m. Free parking will be available on campus. For more information, contact Kyle Finley (kfinley@unomaha.edu) or Dave Pares (402-651-9670). MUFON chapters in Nebraska bring together UFO enthusiasts with an interest in research, study and deeper exploration of the UFO/ET Phenomenon. Active Duty/Veterans - $5 with I.D. 6:00 - 6:05 p.m. … Welcome by Kyle Finley, "Introduction to NE MUFON"
6:45 - 7:25 p.m. … Kristi Pederson, “My Life as an Abductee "
7:00 - 7:30 p.m. … Greg Andersen, "Project Blue Book, The Real Story"
7:30 - 8:00 p.m. .... Steve Snodgrass, "UFOlogy"
9:00 - 9:15 ………. David Pares, “Space Warp Dynamic Update"
is the former president and founder of the UNO MUFON Study Group and one of the founders for the UNO Paranormal Society. He is also the Assistant State Director for MUFON Nebraska and is the Principal Engineer for Space Warp Dynamics LLC. He has a BGS in Native American Studies, Computer Engineering, and Information Assurance from the University of Nebraska. He is currently in graduate school for Biomechanics at UNO. is involved with the Omaha / Bellevue CSETI - Conducting & Understanding Human Initiated Contact - through a global voluntary effort to help humanity evolve into a peaceful universal existence. is a psychic medium in Omaha, NE who has been intuitive since childhood. She has also been a UFO experiencer since the age of five. Trying to make sense of what she was experiencing took years to understand. Finally, being introduced to a support group in the early 90s, she knew she wasn’t alone or crazy. She is the founder of the Omaha UFO Experiencer support group which formed in 2018 to help others the way the original support group helped her. is a State Director and field investigator with the Iowa chapter of the Mutual UFO Network, an international organization dedicated to the investigation of UFOs and extraterrestrial claims. Greg will share his observation and comparisons about the blue project show vs. the real blue book project files. is an American mental health practitioner, social worker, and independent writer known for his development of Integral UFOlogy, a method for evaluating the validity of UFO/ET contact claims. Snodgrass received a BA in psychology and philosophy from the University of Nebraska Lincoln and an MSW in social work from the University of Nebraska at Omaha. He is acting President of the Omaha UFO Study Group and lives in Papillion, Nebraska. is an adjunct professor of astronomy, geography and meteorology and faculty advisor for the UNO MUFON UFO Society and the UNO Paranormal Society. He is the present Nebraska MUFON State Director. Pares has been featured on the History Channel, Discovery Channel, National Geographic, Open Minds Radio, George Noory's "Coast to Coast AM," and Art Bell’s Midnight in the Desert, sharing his research on the Bermuda Triangle and space warp technology. Pares will provide an update on his space warp research. is professor emeritus of physics and astronomy at the University of Nebraska. From 1975-1992, he was a consultant and summer employee at Lawrence Livermore National Laboratory where he specialized in electromagnetic theory and did work on the Star Wars defense system. He spent the summer of 1991 working at NASA’s Marshall Space Flight Center in Huntsville, Alabama. He has continued his research with NASA since that time, studying the surface of the sun. He is also the previous Nebraska State Director for MUFON. Dr. Kasher did a detailed analysis of the STS-48 shuttle mission video that shows anomalous objects moving in space in a controlled manner within view of the shuttle’s cameras.